If you’re considering a Reverse Mortgage you must know how a Reverse Mortgage uses your home equity. In our free information kit we’ve developed a clear picture to answer this question. The graph and definitions below are excerpts from the information kit. This helps to visually explain where and how the equity is used. 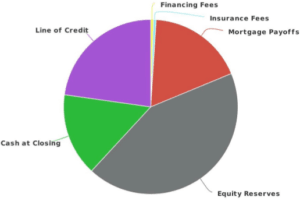 No numbers are used in this illustration as every borrower scenario is different so the percentages can vary based on your individual situation. Financing Fees: These are the standard fees associated with any mortgage. Things like title fees, appraisal, recording fees, lender fees, etc. Insurance Fees: This is the Upfront Mortgage Insurance premium charged by FHA/HUD which is put into the Mortgage Insurance Fund making FHA and Reverse Mortgages possible. Mortgage Payoff: A Reverse Mortgage is a standalone lien which means any other existing liens or mortgages must be paid off at closing. Equity Reserves: Because payments are not made on a reverse mortgage the accruing interest is added to the balance of the mortgage which causes the loan to grow over time. The Equity reserve is equity that is set aside to compensate for the growing mortgage balance over time. This prevents your home from going upside down too quickly. Cash at Closing: These are the funds available for you to access at closing. With a Line of Credit you are not required to take this money but it is available to you after closing. If you or someone you love is considering a Reverse Mortgage in Utah or Colorado and would like additional information, please contact us today for our free information kit.